The effortless way to pick things up. Ideal for picking up litter or rubbish. Magnetic tip for retrieving metallic items. This handy lightweight and durable Grab and Grip tool has a whole multitude of uses - perfect for picking up litter, leaves or any other lightweight items around your home and garden. The long metal body and trigger action control on the handle reduces the need for unnecessary movement, so you can effortlessly pick things up without bending and lifting, all with one simple motion. Plus, the textured handle makes it a comfortable and easy to use tool, whatever the weather. Complete with a magnetic tip to help retrieve metallic objects with ease and a handy wrist strap to reduce the chance of dropping it when you're using it and to make it easy to store. Made from super-lightweight, durable plastic and aluminium with an easy-to-operate trigger, this is a garden tool that you can’t be without! 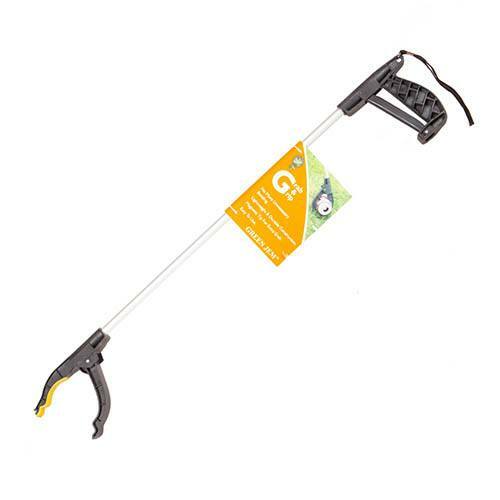 A lightweight aluminium and plastic litter picker 75cm long. Use the trigger action control on the handle to move the pincer jaws and pick up items in one motion with minimal effort.